The initial reaction to programs such as this is to cry foul, blame brands for manipulating bloggers and chide bloggers for accepting what opponents would call bribes.And then there's the issue of disclosure which wasn't really an issue ion this case with the design of blogger's blogs screaming "i9!" A separate reaction this this form of marketing is to realize, whether you agree or not, the world of blogging, and all of media for that matter, is very different from what it once was. Many bloggers would argue they'd just as likely trash a product that was given to them as they would praise it if it deserved negative commentary. With entities like PayPerPost and the seemingly endless supply of "fake blogs" that have existed over the years, it's not surprising this form of marketing receives a heavy dose of negativity. Adrants received a bit of negativity itself by accepting for review a Nikon camera. We used it. We liked it. We said so and we bought it. So yes, there was a period of time during which the camera was a "gift." Did that affect our commentary on the camera? We'd like to think it didn't although we are not so stubborn as to refuse the fact it could have. Besides, we dubbed it "research" so that we'd have first hand experience with this sort of marketing. Is there blame to be assigned with blogger outreach programs such as this i9 effort or Nikon's long-running program? Generally, a wall should still exist between editorial and commerce. Though no one should be so stupid as to assume much of what is written about any product is because, excepting Consumer Reports which buys the products it reviews, the product was given to a person to use for a period of time so that an opinion could be formed and then shared. However, because most bloggers are not for-profit corporations with an infrastructure that, at least in practice, separates editorial from commerce, they are an easy target for those who feel "blogger for hire-style" marketing is a dirty little trick. That also makes it very easy for marketers to approach - pray on, some would say - for these type of marketing programs. Though it might be a lofty thought, one hopes people, for the most part, are honest and are not for sale. Sadly, that isn't always the case which, combined with the dramatic change in the way media is produce and consumed, will keep us debating this issue for years. "because most bloggers are not for-profit corporation". I would love to know what information this is based upon. a. Most bloggers are people, not corporations. b. Perhaps some blogs with the lowest levels of traffic don't have ads (because they are largely unmonetizable). Show me any blog that is considered to have any level of influence and I will show you an ad in the sidebar, paid links, paid content or all of the above. Is that money being donated to charity? I don't think we'll need to worry much about the perversion of small-time bloggers. Coke, WMT, Sony Playstation - they've all tried generating grassroots campaigns and it just winds up landing them bad press. Besides, the traffic and influence just aren't there with smaller and fake blogs. What people should keep an eye out for are paid endorsements and product placements in big-name blogs. Film, TV, and magazines are increasingly embracing in-copy marketing as a revenue stream. Only a matter of time before we see more of this happening in the bigger blogs. Ironically, it's the smaller bloggers we'll often be relying on to do the detective work and discover the back-room deals. 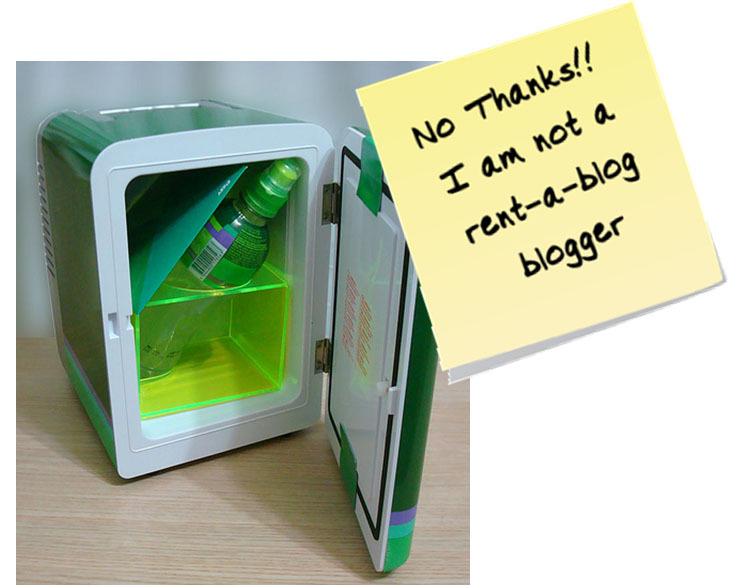 "As part of the promotion, coke redesigned the bloggers' pages and gave each of them miniature refrigerators with a bottle of i9 inside." Coke just sent the miniature, didnt redesign any blog page since there was no partnership, they just send and bloggers published the history if they want to do it. "the creation of an "I am not a rent a blogger" manifesto"
where do you get so much wrong information from? Yep but this manifest isnt againt the coke strategy but against Blue Bus the jealous blog callling the 9 as rent blogs. 1) The debate is started with the post saying the blogs are rental blogs. Totally wrong information by an old school ad gossip site. 2) "The manifesto isn't against the Coke strategy but against Blue Bus the jealous blog calling the 9 as rent blogs." 3) "Coke just sent the miniature, didn't redesign any blog page since there was no partnership, they just send and bloggers published the history if they want to do it". Coke paying for blogging is no different than Coke paying 'Street Teams' to sample product. Both groups are paid for conveying a new and/or positive message about the product. Paid bloggers can be viewed as the online form of 'Street Teams'...you just can't see them live!